Guinea pigs (or cavies as they are sometimes known) are sociable little creatures, they love company and like to be handled. Despite their name, guinea pigs have nothing at all to do with pigs, they are actually part of the rodent family! Guinea pigs originate from the Andes mountain region in South America and when they are in the wild they prefer to live in herds. Of course, you wouldn’t want a herd of guinea pigs living in your home, but they are very sociable creatures and it is best to keep them with another guinea pig friend. 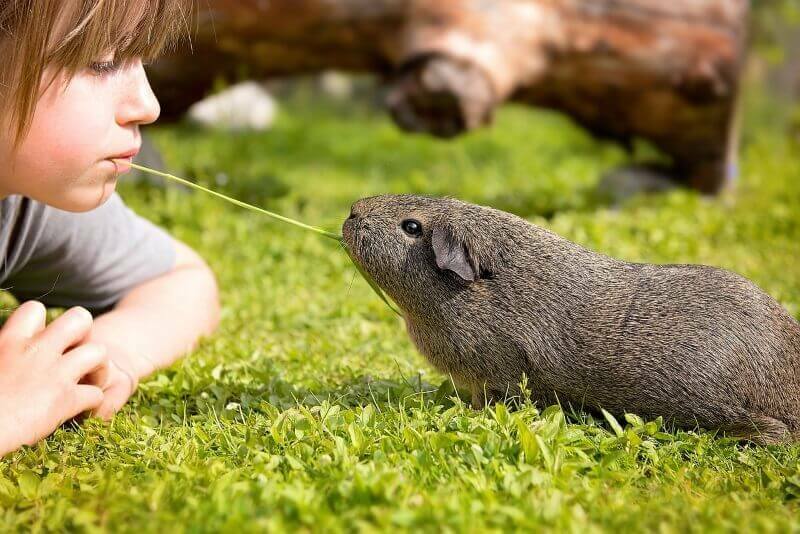 Guinea pigs make great pets – they are intelligent, friendly, fun to watch and really enjoy being part of the family. You can train your guinea pig to do all sorts of things, but first, make sure your pet has a safe place to call home and get the basics in place before you start any training. A secure cage (in a quiet area, but not too far away from you, they like company)! Once you have everything in place you can make friends with your guinea pig by talking to him (pop a few treats in his cage while you do this), so your guinea pig associates you with nice things! 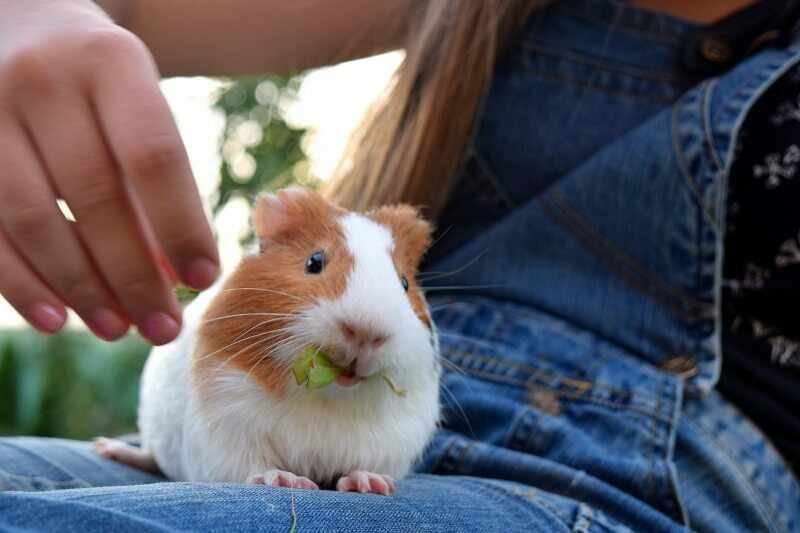 When you are ready to start training your guinea pig, you will need to provide plenty of treats to encourage and reward your pet. There are many different foods you can use. Stick to wholesome, unprocessed goodies to keep your guinea pig healthy. Guinea pigs love fruit but watch the sugar content (berries are a healthy option). Avoid human food (cookies aren’t good for guinea pigs)! Make sure you secure the area where you are going to teach your guinea pig. Is it safe? Can your little friend escape or get stuck anywhere? It is also important to remember that guinea pigs have very sensitive ears, they really don’t like loud bangs and lots of noise, so make sure your chosen training area is a calm and quiet space. Handle your guinea pig carefully and build up your confidence before you start any training. When you are ready you can get started – make sure you are armed with plenty of healthy and tasty treats and get ready to have some fun teaching your guinea pig lots of amazing tricks. Guinea pigs are very smart and they can be trained to do many tricks. Keep on reading to learn how to train your guinea pigs to recognize their name, follow you, to stand up, play with a ball, to use their litter and more. Put your guinea pig on the floor, a little distance away from you. Put a couple of treats in your hand. Call your guinea pig’s name and make sure your pet can see the treats! Repeat until your guinea pig responds every time you call him. Make sure your pet recognizes his name (see above). Use your guinea pigs name often and talk to him whenever possible. Give your guinea pig a treat or two when you use his name. When you get your guinea pig out of the cage put him across the room from you. Place a few treats in your hand and make sure your pet knows you have them! Call your guinea pig by his name and give him the treat when he comes to you. Practice daily so your guinea pig associates coming to you with getting a treat. Kneel on the floor and put a row of treats on the floor in front of you. Make a line from where you are kneeling to where you are going to put your pet. Put your guinea pig at the end of the line and call his name. Encourage your guinea pig to follow the treats all the way to you. You can have an extra special treat on your lap e.g. juicy fruit or fresh veg. Practice daily so your guinea pig associates following you with yummy treats. Use less treats each day, but still give your pet a special treat if he makes it to you! Learning your guinea pig how to use the toilet will take a lot of time and patience. He will need lots of encouragement (expect a few mishaps and do not tell your pet off when he accidentally poops in the wrong place)! Identify the place in your guinea pig’s cage where he likes to poop. Put some hay in the preferred “toilet area” (add a few poop pellets in with the hay). When you see your guinea pig using the new hay litter box area give him a treat. Don’t forget to praise your pet when you give him a treat for doing so well! Keep doing this each time you see your pet using their new toilet. For a more detailed guidance, see our comprehensive potty training guide. Guinea pigs are certainly cute and are naturally friendly animals, but like all animals, they can bite if they are feeling threatened. Don’t confuse biting with mouthing, these are two different behaviors! Guinea pigs are very curious creatures and they want to get to know you just like you want to get to know them. Your pet may mouth you just to find out more about you (are you some sort of giant tasty treat)?! Mouthing isn’t a sign of your guinea pig being cross or upset, just a sign that your pet is interested in you! Biting is very different, a guinea pig that bites is a scared guinea pig. Your pet doesn’t have much to defend himself with, so if he feels threatened by you don’t be surprised if he uses those little teeth to nip you as a warning. Show your guinea pig that it does not need to be scared of you. Give your pet lots of love, speak kindly to it and remember to offer lots of healthy treats! Make sure you aren’t scaring your pet with odours it doesn’t like e.g. dog/cat smell. Wash your hands before handling your guinea pig. Cover up or remove any clothing that may smell of other pets. Handle your guinea pig in a quiet and safe place. Hold your guinea pig carefully and be gentle! He will bite if uncomfortable! If your guinea pig suddenly nips you he may be trying to tell you he needs the loo! An unhappy guinea pig may bite – is he lonely? Does he need a friend? An ill guinea pig may bite, if your pet bites a lot get him checked by the vet. A guinea pig with too much testosterone may bite – he may need to be neutered. Hold the tasty treat just above your guinea pig’s head. Encourage your pet to stand in his back legs in order to reach the treat. When they are standing on their two back legs give them the treat. Repeat daily until your pet stand up on command. Eventually, your pet should stand up without the need for a treat! Put the treat (the strip of red pepper) on the floor and put the ball on top. Make sure your guinea pig can see that there is a treat beneath the ball. Say “push the ball” to you guinea pig as they try and gain access to the treat. Practice daily, in the end your pet will push the ball on command, without the treat! Find a hoop that is a good size (not too big or small)! Around 10” would be ideal. If you can’t find one then make one (pipe cleaners connected together work well). Make sure you use a hoop that is smooth and that won’t hurt your pet. Hold the hoop so it’s very low down, it should touch the floor. Hold a treat on the one side and make sure your guinea pig can see it. Don’t be cross if your pet isn’t interested at first, be positive and encourage him! A very gentle push in the right direction might help. When your guinea pig jumps through offer plenty of praise and a tasty treat. Practice daily and your pet will eventually become a great little jumper! Hold a treat in your hand and make sure your guinea pig can see it. When your pet comes toward you move your hand in a circular motion. While you do this say the word “circle” clearly. Your guinea pig should follow your hand (or rather the treat). When they have completed their circle offer them the treat as a reward. Practice daily and eventually, your guinea pig will show off circling without a treat. Your guinea pig is a loving and responsive pet, he will love plenty of praise, attention and affection. If you are going to train him to understand commands and perform tricks remember to be kind, patient and gentle. Offer plenty of healthy treats when you are training and always make sure the environment is suitable for your furry friend. Fulfil your guinea pigs needs by ensuring he has a comfortable and secure home, with nourishing food and refreshing drink. If you can do this for your pet you can congratulate yourself on being a responsible and caring pet owner. 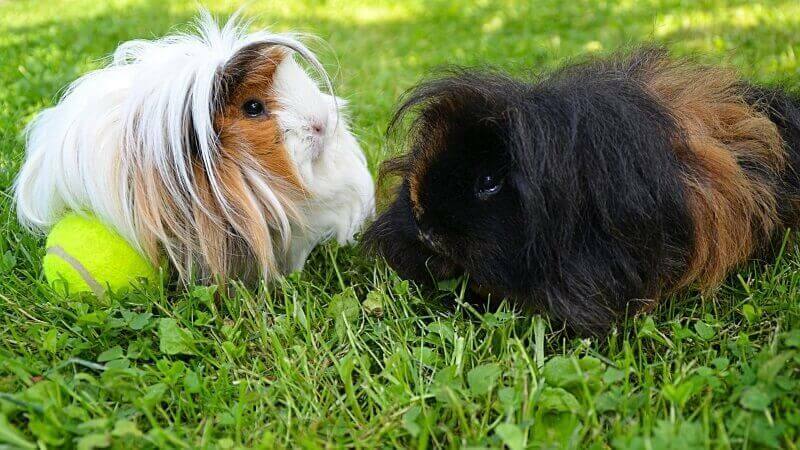 Enjoy looking after your guinea pig and have fun with your furry best friend. 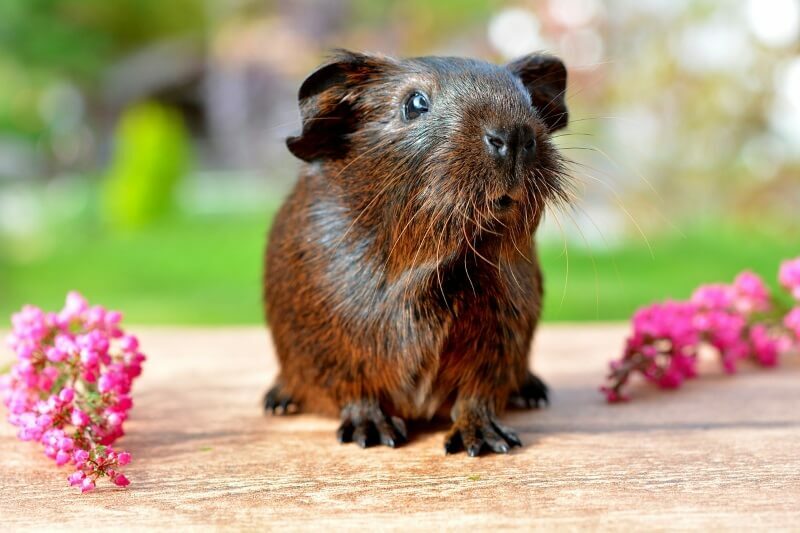 If you look after him well you can enjoy his company for up to eight years, but the world record for the longest living guinea pig is an impressive fifteen years! Sorry to hear that 🙁 Some guinea pigs can be hard to train so you might have to work with them for weeks until they are trained.